This entry was posted in About Beliefs, Mind Tricks and Traps and tagged authority, beliefs, Carolyn Myss, Catholic, discipline, emotions, Freedom, good and evil, inspiration, LETTING GO, pleasure, weight, win and lose. If you see discipline as persuasion from authority, and your authority is someone else, then it takes you to hell. But the truth is the authority is always you, you only give it away out of fear. The true authority is our heart, that persuades you to see what is true or false. But most people gave their heart away. They dont follow their hearts. Which is another missunderstood term. Follow your heart, perhaps is the worst advice to hear when you dont know how to. Great post Cathy. In my language ‘discipline’ is made up from two words, persuation and authority. Discipline as a word is missunderstood. Most people take it as a punishing process of learning from an authority but it is an individual action having to do with skill. Discipline is skillfullness to learn but not learning from others but from your own inner thinking. You might say its a skill to follow your heart. In some cultures when you wanted to learn, let’s say farming, you watched a skillfull farmer, and if the farmer was doing a good job, he would enjoy it and you capture his skill by osmosis, or plainly said, when you saw him happy in his farming you realized you could do it too and in most cases you would learn farming by watching the joy of it and not just as an act of punishment if you dont do it well. In older cultures, mostly natives, the younger ones learned their skills by their elders and the elders didnt give a technique to do it but somehow an expression of ‘if i can do it so can you’ because they were enjoying doing it. They were in a way thankful to nature when they farmed or do anything. Young ones tend to imitate, but a smart elder was teaching them to follow their own creativity and he was just showing them some small practical techniques too. 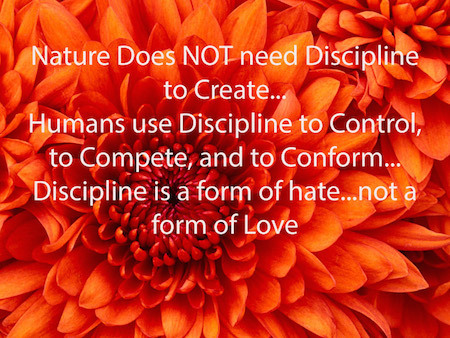 So you could say that discipline is the skill(art) of following your inner spirit(heart) as indians called it. Inner spirit gives out the word in-spiration. But in modern times people dont have patience, they all run for survival so you lose your inspiration and you beat yourself and others to learn doing what was supposed to be fun. So to me when i hear the word discipline it just means skill. But only skillful people can trully ‘discipline’ or teach.